Some soap opera faves took to the streets Saturday to voice support for the rights women. The day before, Donald Trump was sworn in as president. Trump’s opponents have expressed concern that he and his administration will dismantle many of the legal protections afforded women. A march inspired by one such opponent that gathered in Washington, D.C. the day after Trump’s inauguration inspired marches around the country. Some of daytime’s brightest stars made appearances. Soap vet Jason Thompson (Billy Abbott, “The Young and the Restless”) posted a pic to Instagram of himself, his wife, and his infant son at a rally in Los Angeles. He explained how their life experiences informed their decision to march. Camryn Grimes (Mariah Copeland, “The Young and the Restless”) also posted to the photo sharing site. She echoed a song from “Les Miserables” in her caption. “Do You Hear the People Sing?” gave voice to the growing French rebellion in that iconic play. Ironically, Trump played it at a rally during his campaign for president last year. She was in Los Angeles. Karla Mosley portrays a trans-woman, Maya Avant, on “Bold and the Beautiful.” She Tweeted about the powerful emotions attending the march in the nation’s capitol elicited in her. Jeffrey Vincent Parise (ex-Carlos Rivera, “General Hospital”) shared a photo of himself and three male friends at the same march. He wrote of how their attendance at it was a show of solidarity with women. 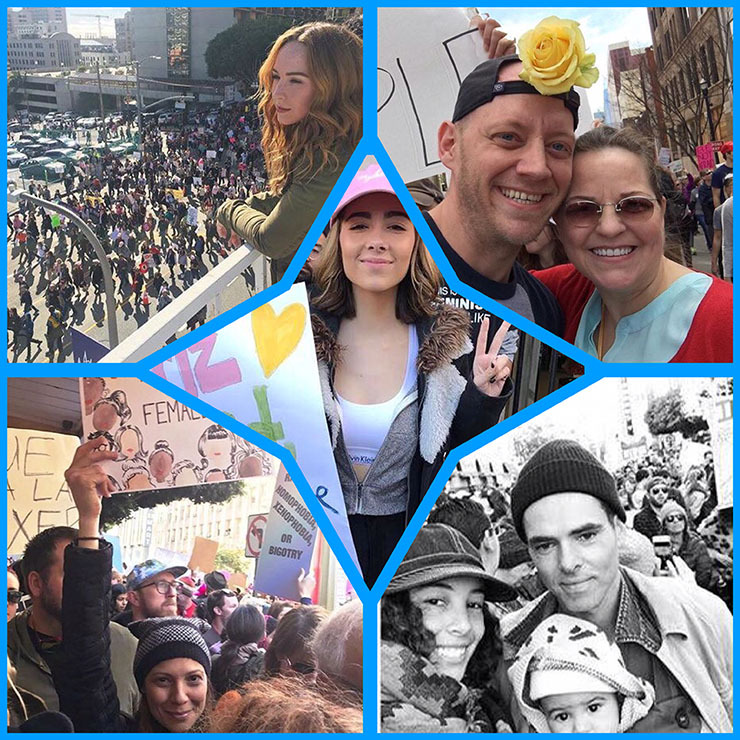 Haley Pullos (Molly Lansing-Davis, “General Hospital”) was also attended the march in LA, complete with a clever protest placard. She donned a pink hat as did marchers as around the nation. Nashville has become a primary or secondary home for many soap stars who are passionate about country music. Tricia Cast (ex-Nina Webster, “The Young and the Restless”) took part in a march there. She and a “new friend” can be seen beaming with joy in her Instagram shot. Tamara Braun (Ava Vitali, “Days of Our Lives) has played a few powerful women in daytime. Those characters have run the gamut from full-on villains to classic soap heroines. The actress often posts to social media about her strong beliefs about social justice. This weekend she did just that.